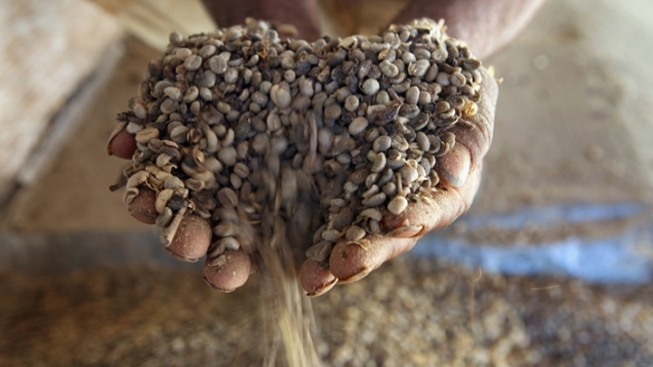 A worker inspects unroasted coffee beans, which may assist with weight loss. A University of New Hampshire chemist says he's developed a coffee that provides the same benefits to the heart as red wine. The Portsmouth Herald reports Glen Miller infused Arabica coffee beans with resveratrol, the natural antioxidant found in the skins of grapes used to make red wine. Miller says the infusion happens during the roasting of beans for his CoffVee product to achieve its heart-healthy effect. Miller first developed the process of combining coffee beans with resveratrol in his kitchen. He says each cup of CoffVee provides the same amount of antioxidants as a glass of red wine. Miller says he considered adding resveratrol to tea and bottled water before settling on coffee. He's selling the coffee through his Vera Roasting Company.